Lexington hosted the third installment of the Creative Cities Summit late last week (previous editions were in St. Petersburg in 2004 and Detroit in 2008), and the event was headlined by internationally-recognized experts in urban growth and vitality: Charles Landry, Rebecca Ryan, Richard Florida, and Bill Strickland, among others. The event drew participants from across North America, but most of the attendees seemed to be from Lexington. And while Lexington was not the central focus of the event, our city naturally entered into many of the conversations. In the wake of the event, a vigorous local debate emerged about whether Creative Cities was significant for our city. What’s intriguing is that much of the debate is occurring between folks who normally get along. And much of the negative criticism is coming from folks that I like and respect (see here, here, here, and here), and who aren’t typically curmudgeonly. That criticism has led to head-scratching – and, at times, indignance – from those who felt that the summit was a worthwhile, transformational, and enlightening experience. And that leads us to an interesting – and telling – distinction: Most of the attendees of the summit seemed energized by the discussions and the ideas which emerged from Creative Cities; Most of the criticism came from those not in attendance. 1. It was too exclusive. This criticism usually centers around conference participation: who was invited, who wasn’t, and the perceived snobbery of some of the attendees. 2. It was too expensive. This criticism focuses on the $199 registration, and whether the scholarships to the event were adequately publicized. The conference was too self-involved and self-congratulatory, and prioritized self-help and good feelings over substantial change. It glorified out-of-town gurus who repackaged the obvious while angling for their next consulting gig. It didn’t involve enough meaningful action, and thus amounted to a vacuous echo-chamber of do-nothing happytalk. As an attendee of the summit, I find a kernel of truth in all of these criticisms. But I don’t think that any of them are completely fair, and none are particularly helpful in crafting a better future for Lexington. I have to admit I’m not all that patient with the ‘exclusive’ or ‘expensive’ arguments. Everyone was invited; everyone had a chance to participate. While the price of the event was problematic for many, it was far cheaper than similar events with participants of this caliber. Events like this cost a lot – and high-quality speakers, food, and facilities are necessary to draw a national audience. What concerned me the most about these critiques was that the perceived exclusivity or expense of the event often became an excuse for dismissing the good ideas which arose there: A good idea is still a good idea, even when someone has to pay to hear it. And if the criticisms of conference ideas are based upon bruised egos and hurt feelings, then I’ve got zero patience for that. I’m much more sympathetic to the ‘too much talk’ reasoning. Before I bought Lowell’s, much of my corporate life was spent in the company of very skilled consultants: research consultants, design consultants, business strategy consultants. There was a predictable part of nearly every consulting engagement where the consultant would suggest that hiring them for another engagement was part of the solution to the problems we hired them to resolve – “The way you fix that is to hire me again!”. Consultants always position themselves for doing more consulting. We did get to see that angling-for-the-next-gig routine with some consultants at Creative Cities. And admittedly, there was a little too much excitement over slick ideas and catch-phrases, and not enough thought about the hard work needed to truly transform Lexington for the better. But that hard work isn’t what a conference is for: The summit was for learning and for exchanging ideas; the hard work comes after. The structure of the conference didn’t help its perception – especially on Twitter – for those who didn’t attend. In the process, I think some of the shortcomings of Twitter for civic conversations like these were exposed. The most compelling (and, presumably, highest-paid) ‘keynote’ speakers addressed all participants at the same time. For these speakers, attendees usually tweeted about the same inspiring messages, giving rise to the echo-chamber perception. For instance, when Bill Strickland spoke at the end of the conference, many non-attendees mocked his ‘poor people should be considered assets, not liabilities’ line. They seemed to say What fool would pay to hear something so blatantly obvious? But Strickland had spent several emotional minutes demonstrating how attitudes, institutions, and architecture in his native Pittsburgh neighborhood treated poor people like liabilities. At the same time, he had shown how he had successfully used beauty and light and architecture and respect to transform his home neighborhood by treating poor people like assets. When those present tweeted the ‘assets’ line, they were truly moved and inspired by Strickland’s story and context. Those outside the venue only saw vacant platitudes. This same pattern repeated itself again and again throughout the other keynotes: The rich, compelling images and backgrounds and stories couldn’t traverse Twitter effectively; only the catchiest (and apparently empty) phrases made it out. Detroit’s strategies for reviving long-neglected neighborhoods, building-by-building and block-by-block. How Toronto and Portland are funding and implementing inspiring, for-profit social innovation initiatives which pull people and neighborhoods out of poverty and make their cities more livable. The model Massachussetts’ Creative Economy Director uses to get tangible economic development successes in arts, software, design, video games, and music. From the discussions around my table, other Lexingtonians learned even more from the sessions I wasn’t able to attend. We also talked with people on the ground in Atlanta, Des Moines, and San Antonio about their experiences in their cities. Because I was so busy listening and taking notes, I was much less occupied with getting the word out on Twitter. I saw this effect repeated with other attendees, as well. So the resulting Twitter stream was decidedly biased in favor of the least-important, most self-helpy kinds of messages, while the deeper, more important insights went relatively silent. And I think that is the source of the skepticism and derision from those ‘out-of-the-room’, while those ‘in-the-room’ were decidedly enthusiastic about how the event played out. Will the Creative Cities Summit matter to Lexington? It is far too early to tell. It will take time, work, and discipline to realize the vision that many of us had leaving the summit. 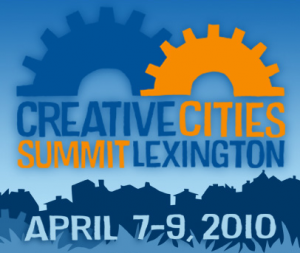 Should the Creative Cities Summit matter to Lexington? Seeing the innovations that other cities have applied in improving their quality of life is vital as we attempt to build a better Lexington. We need that kind of cross-pollenation with our own innovative initiatives to ensure the best possible future for us and for our city. For those who feel as though we need a lot less talk and a lot more action, then mark this coming Saturday 17th April on your calendar. That is when ProgressLex is hosting the Now What, Lexington? ‘unconference’ at the Carnegie Center in Gratz Park. Now What? is explicitly geared toward generating tangible action from the ideas of the Creative Cities Summit. Whether or not you attended Creative Cities, you should come to Now What? if you want to join with others to make Lexington better. Now What? will be tweeted, too. But it will be better if you show up. As we’ve seen, Twitter isn’t always the most effective medium for conveying important ideas. It is free. Everyone is invited. We’ll be doing things. No excuses. Read more of the continuing conversation about the Creative Cities Summit on Twitter with the hashtags #ccslex, #uncreatives, and #uncreativelex. Read about the upcoming Now What, Lexington? unconference with the hashtag #nowwhatlex. Full disclosure: Lowell’s is a sponsor of Now What, Lexington? As someone who wanted to attend but missed the CCS, I was anxiously waiting for video/youtube of the event to be posted. Was a video ever taken of the event? Chris, there was video, but I don’t know how public it is, and if/when/where it is going to be posted. Well said Rob. Personally it inspired me and even though I won’t be able to make the first NOW WHAT LEX (hoping there are more than one), I do plan to follow up w/ those that attend and will also realize that what gets tweeted is about 5% of what is actually happening there. Those that only follow an event’s twitter stream and use it generalize an audience or conference are getting little info. A clear example here is when blogs are complaining about organizations not being represented as speakers at the conference that actually were and did a great job presenting (i.e. WRFL and Boomslang) just because they didn’t see it on twitter. Rob, I enjoy your comments and always find them well thought-out, but I think you’re missing the boat, particularly with regards to the narrow range of critiques found in the articles you cite above. Setting the perceived Ace and Mecca snubs aside (both valuable entities that are headed by, it should be pointed out, people who already hold immense cultural capital in this city), the price-point for participation–most of which went to pay already-wealthy speakers–did disallow access, as did the conversations and times and dates of the conference. Head up Upper 3 more blocks from your garage and you’ll see what I mean. None of these people even had a chance to get a seat at the table. So when you write that “[e]veryone was invited; everyone had a chance to participate. While the price of the event was problematic for many, it was far cheaper than similar events with participants of this caliber,” it is important to note that this statement does not apply to most Lexingtonians, but rather to a small slice of Lexingtonians who had (a) the time to take away from work to attend; and (b) the money to devote to a conference that, by your own estimation, was about nebulous ideas and not action. And it wasn’t just that people didn’t know about the scholarships. Heck, I got offered a complete scholarship–a fully employed, tenure-track community college professor married to a fully-employed nurse–b/c I lived on the North Side. I couldn’t help but think, gee, if I’m the hardship case they’re trying to attract to the conference, then there are a lot of people way below me economically and culturally who don’t even have a foot in the door (but who, by your logic, were perfectly welcomed and should have known the kind of deal they were getting compared to other events held around the country). To place blame for non-attendance on those who didn’t fork up the money is to seriously undercut what are some legitimate grievances those left-out had or may have. It’s not just that they were not invited, it’s that their concerns are not being addressed in the slightest. And I’m not talking about my own personal concerns or Kakie Urch’s or Ace’s–three entities who, in comparison to the rest of the city, are doing just fine thank you very much. It’s not sour grapes; it’s a deep problem with the range of ‘creative’ that Florida’s Creative Class plugs into. I didn’t attend because I see very little value in what is being peddled; in fact, I see what is being peddled as, in aggregrate, detrimental to all but a small slice of Lexingtonians (a viewpoint that your linked examples also do not address). Take, for example, your realization (at last) that twitter might have some political and social drawbacks. While you finally noted the empty nature of most twitter blasts (blatantly evident, too, in that other creative endeavor, the online mayoral forum held last month), you haven’t even addressed the fact that most people in Lexington aren’t even on twitter, nor do they have time in their daily lives to follow something like that. What sort of people do? What class of people do? If people aren’t getting involved, it’s not because they chose to miss their opportunity. It’s because they can read between the twitter lines, and they see that the creative class isn’t something that they’re are empowered to have a say about. Thanks for the thoughtful commentary on the Summit, especially regarding Twitter. That is an important element to consider for future Summits and similar events. Hey Rob, Be sure not to attend the street party for the “mile long gravel pit” (your tweet) next week. No Johnny-come-latelys allowed. The rest of us who are and have been very appreciative of the great project, and the speed at which it was done won’t miss you. Thanks for disinviting me to the South Limestone street party. I always appreciate disrespect from public servants. At least (this time) you weren’t posting while on my dime. Sorry to disappoint you, but I will be there to support my friends who own and work in businesses along the construction zone. I have been an avid supporter of those businesses, including organizing lunchtime ‘LexMobs‘ every day for the first six weeks of the South Lime closure. It is all too easy to sit in your LFUCG office and criticize, Chris. But what have you really done to ameliorate the pain caused by the year-long closure? I’ve never been opposed to the idea of improving Lexington’s streetscapes; I just objected to the awful planning, execution, and overspending of this project. Closing a major artery to downtown for a year – without providing an commuter-friendly alternative like converting South Upper to two-way before closing South Lime – was extraordinarily short-sighted. It hurt businesses throughout downtown. It destroyed a significant portion of Lexington’s tax and employment base. It accounts for about one-third of the city’s budget shortfall. Do I hope South Lime succeeds and is beautiful? Absolutely. Do I think the project could have been done better than it was? No doubt. I know you and your Planning buddies dislike my criticisms of how poorly planning works in Lexington, but try to refrain from personal attacks and to remain on-topic in future comments.